The Classic design is manufactured to reach the highest quality standards available in today's pet urn marketplace. Take your beloved pet home in one of these wonderfully designed urns with hand-carved paw prints. These urns are true works-of-art as they are hand forged and carved by old-world artisans from India. Each vase comes with a threaded screw-on top for easy and safe installation of your pet's ashes. Take your beloved pet home in one of these wonderfully designed slate colored Paw Print Series urns with hand-carved paw prints. These urns are true works-of-art as they are hand forged and carved by old-world artisans from India. Each vase comes with a threaded screw-on top for easy and safe installation of your pet's ashes. This solid brass metal vase style is available in a Small, Medium, Large and X-Large size depending on the size of your beloved pet. 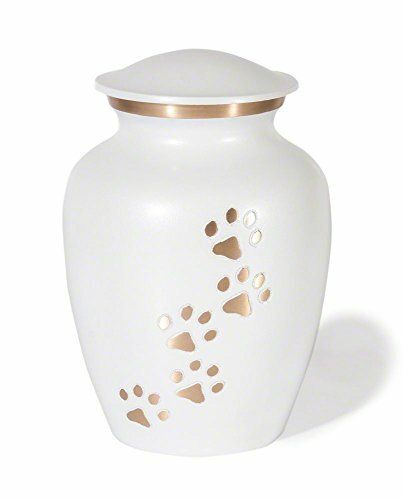 The Classic paws pet urn is constructed of solid brass and Hand Carved Paw Prints . The Classic paws Series Pet Urn Pets are more than just companions - they become family members. And like the death of any relative, losing a pet is painful. Many have found comfort and condolence in memorializing late pets. Pet urns memorials are a perfect way to work through your grief and express your everlasting love for your pet. Take your beloved pet home in one of these wonderfully designed pet memorial urns with hand-carved prints. These urns are true works-of-art as they are hand forged and carved by old-world artisans from India. Each pet urn comes with a threaded screw-on top for easy and safe installation of your pet's ashes. This solid pet urn is available in a Small, Medium, Large and X-Large size depending on the size of your beloved pet.. Durable Permeant Enamel Slate Finish, Engravable: personalize your pet urn with these beautiful and unique, engravable, pet urns.